The Congo research briefs are a joint publication of the Conflict Research Group (CRG) at Ghent University, the Social Science Research Council (SSRC), the Study Group on Conflicts and Human Security (GEC-SH) at the University of Kivu Research Center (CERUKI), and the Governance-in-Conflict Network (GiC). These will provide concise and timely summaries of ongoing research on the Congo that is being undertaken by CRG, SSRC, GEC-SH, GiC, and their partners. The authors would like thank the researchers from GEC-SH who collected the data for the survey. They are: Alice Mugoli Nalunva, Bienvenu Wakusomba Mukungilwa, Christian Chiza Kashurha, Damase Barhalikubagirwa Buhendwa, Francine Mudunga Chakirwa, Irène Bahati, Jérémie Mapatano Byakumbwa, Stanislas Bisimwa Baganda, and Lea Babite. We would like to also thank Philip Stickler who produced the maps featured in this brief. Funding for the research for this brief from the Norwegian Institute of International Affairs (NUPI) through the project “Follow the Money” (233823) financed by the Norwegian Research Council is gracefully acknowledged by the authors. This material has been funded by UK aid from the UK government; however the views expressed do not necessarily reflect the UK government’s official policies. This article also benefited from funding from the European Research Council (ERC) Grant: State Formation Through the Local Production of Property and Citizenship (Ares (2015)2785650 – ERC-2014-AdG – 662770-Local State). 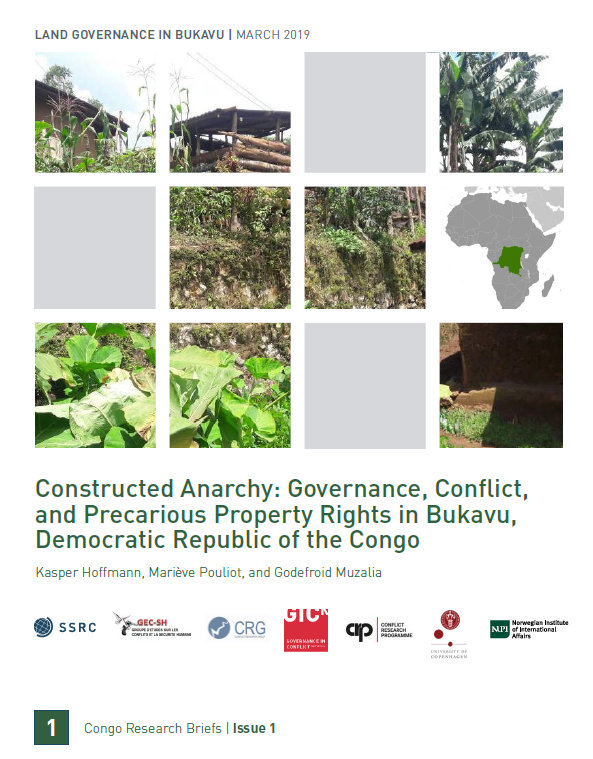 Constructed Anarchy: Governance, Conflict, and Precarious Property Rights in Bukavu, Democratic Republic of the Congo (New York, New York: Social Science Research Council, March 2019).